Europe Dental Implants Market size was valued at USD 1,576.3 million in 2017 and is expected to witness 4.1% CAGR from 2018 to 2024. Increasing dental tourism across Europe will significantly stimulate dental implant market growth. Implant dentistry is offered at much lower costs in Europe as compared to other developed regions. Dental tourism is available in European countries such as Poland, Hungary, Spain, Czech Republic and other countries. Hungary provides excellent quality dental procedures at highly affordable prices. It has a high dentist per capita ratio with specialized and minimally expensive treatments even in rural areas. Thus, dental tourism renders attractive growth opportunity to dental implants business during the forecast years. Advancements in dental implantology will impel industry growth owing to improved imaging and better benefits to the patients. Certain advancements are being made to improve implant surface as well as clinical conditions. Digital technology enhances visualization whereas implant surface technology allows immediate implant placement. Technological advancement such as Cone Beam Technology coupled with CAD/CAM technology is being extensively used for efficient diagnosis of patients’ oral health. These advances will eventually increase patient preference for dental implants, thereby augmenting market growth. Increasing prevalence of oral disorders in Europe should propel regional growth over the coming years. According to WHO, about 20%-90% of children aged 6 years are suffering from dental caries. Additionally, there is large patient pool in Europe affected by periodontal disorders. These factors increase the risk for tooth loss. 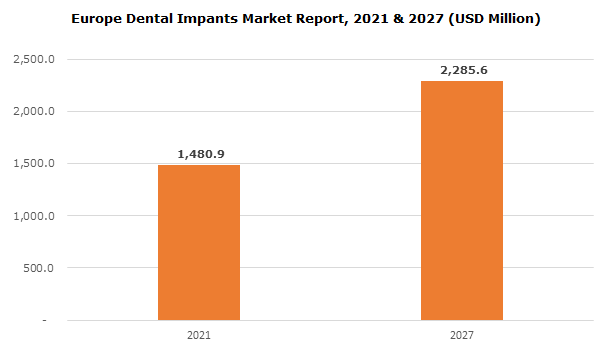 Increasing incidence rate of dental problems coupled with rising risk factors should drive the demand for Europe dental implants market growth during the forecast timeframe. Tapered dental implants segment accounted for 73.6% share in 2017 in Europe. High market share is credited to advantages such as high propensity and clinical success rate. These implants increase the primary stability and copes up with patient’s anatomical limitations. Superior benefits over parallel-walled implants should drive segmental growth in forthcoming years. Titanium material segment contributed to USD 1,115.9 million in 2017 and is forecasted to grow at a remarkable pace by 2024. Titanium is widely used for manufacturing implants owin to its stable nature, biocompatibility and excellent mechanical properties. It also provides corrosion resistance upto some extent. 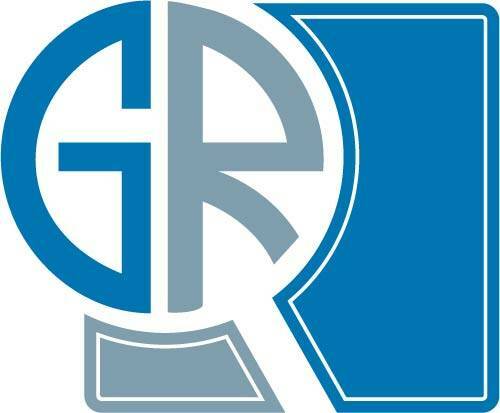 These beneficial properties will lead to substantial segment growth in the forthcoming period. Dental clinics end-use segment will grow at fast pace of 4.3% CAGR over the projection period owing to increasing number of dental clinics and dental service providers across the region. The Dental Conference 2018 provides the dentists, clinicians and dentistry students with knowledge-transfer platform. In addition, the Dental Congress offers a forum for advancement in dental health to clinicians. This will facilitate availability of skilled professionals in dental facilities along with greater awareness among the European population. Germany dental implants market accounted for the largest market size of USD 289.6 million in 2017. High market size is attributable to rising dental tourism, presence of substantial number edentulous population leading to increases demand for modern tooth replacement. Increasing trend coupled with extensive dental tourism offered in Berlin and Colin city of Germany will favor regional growth. Some of the prominent market players in Europe dental implants market are Danaher Corporation, Dentsply Sirona, Henry Schein, Institut Straumann AG and Zimmer-Biomet. Major companies are focusing on collaborations and partnerships to capture substantial market share. For instance, in April 2017, Zimmer Biomet announced collaboration with NovaBone Products. This initiative will help in increasing the sales of the dental products, thereby increasing the firm’s revenue. Titanium implants marked the introduction of dental implants in 1960s followed by Zirconia implants in 1975, in Europe. Titanium implants recorded high success rates. However, gradually dental implants witnessed shift in material to ceramic/zirconium implants due to benefits including absence of corrosion and allergic reactions in patients. Ceramic implants have many advantages and advancements are still being made in order to offer best suited implants for fortifying patient’s treatment and cosmetic value. In addition, increasing awareness and sophisticated dental facilities are estimated to boost dental implants industry growth in the foreseeable future.